Home » Pelajaran » Telling Story "Little Red Riding Hood "
Long time ago, in a little village, at the edge of the forest, lived a little girl with her mother. Her name was Little Red Riding Hood. She was sweetest and cutest child in the whole town. She always wore a pretty red cloak and hood that her mother had made for her. All the forest folks knew her well. Particularly a wicked old wolf had often watched her and thought she looked good enough to eat. One day, Little Red Riding Hood's mother said, "Take this basket of bread and goodies to your grand ma as she is not well these days and cannot cook for herself." Her mother strictly instructed her not to talk to any stranger on the way. The wicked old wolf was hiding behind the bushes. He was listening to all the conversation carefully. Ahhha… this is a great chance for me to eat the lovely girl, said the wolf. He planned to reach granny's cottage before Little Red Riding Hood could reach. Little Red Riding Hood skipped merrily along the forest path, enjoying the bright sunshine, the blue sky and the birds singing in the trees. Meanwhile the wolf reached her granny's cottage and managed to enter inside. He frightened the old lady and pulled her in a dark room. Then he took her gown, wore it and eagerly waited for the little girl to come. Soon the door bell rang, the old wolf opened the door and welcomed Red riding hood. The girl was quite surprised to see her grand ma covered in a shawl she also found her granny’s voice a little different so she asked her ‘Are you ok Grand ma’? The wolf replied ‘yes my dear’. She gave the basket of goodies to her. The wolf thanked and asked her to come closer. 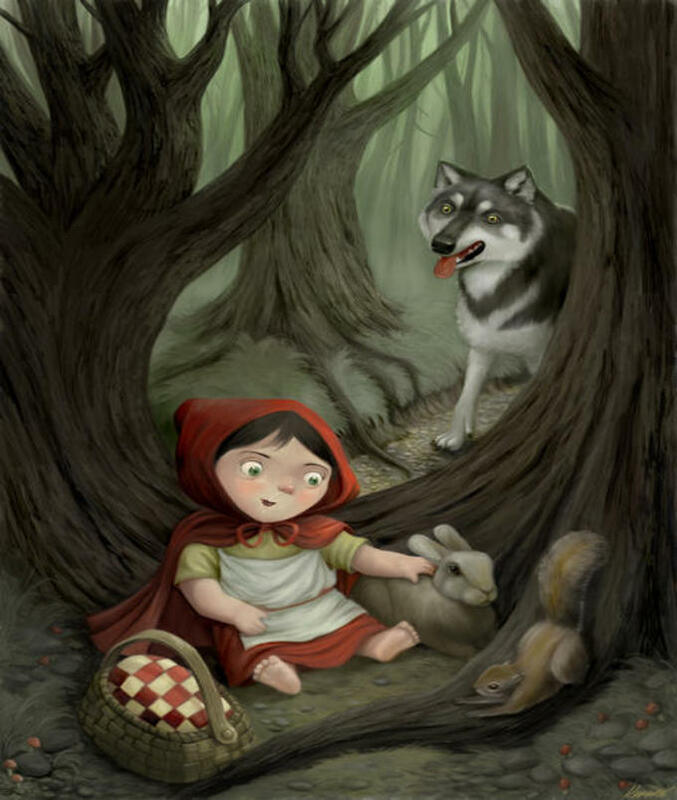 As Red Riding Hood stepped forward, she could see the big ears of the wolf. "Grand Ma", she said, “what big ears you have got". "All the better to hear you with, my child" replied the wolf. "And what big eyes you have" "All the better to see you with, my dear." The girl was realizing that she was not her Grand ma. She saw the big teeth of her grand ma and asked her again "What big teeth you have”. "All the better to eat you with," cried the wolf and jumped on the little girl. Red Riding Hood turned around and ran out of the cottage. She was crying for ‘help’. A forester passing by heard her cry and came near the cottage. Little Red Riding Hood told him about the wicked wolf. The forester entered the cottage to kill the wolf. He was lucky that the wolf was busy in removing the clothes. Without wasting any time he killed the wolf with the hammer. Then they both brought the grand ma out of the dark room. The girl explained the whole incident to her grand ma. The grand ma kissed the little girl and took her inside the cottage.